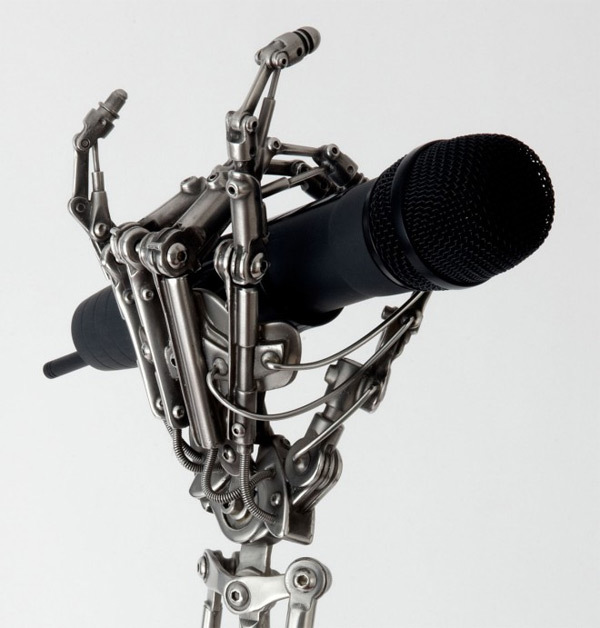 Created by artist Chris Conte from scrap pieces of metal and steel rod, this Terminator esque microphone stand was designed for lead singer of the band Three Days Grace. Chris has created three stands in total (two purchase by the band for their tour) which are constructed from stainless steel and using brass for the quick release mechanism around the microphone. The arm in the photos is actually a casting of the original mic stand, using the lost wax process of casting. Eleven separate silicon moulds need to be made to create the piece and took about 3 months to complete. Chris is now working on building four insectoid creatures from recycled watch parts, which should be very interesting.